The Ink Trap: Mail from Mom...On the Dark Side! Hello! It's time to feature Mom's cards. So many of you have shared with me that you love seeing Mom's cards on my blog and I love sharing them with you. One of these days we might just get Mom set up with her own blog, but until then I'll keep showcasing them here one day each week. The days might move around, so check back frequently and watch for them. Mom and I loooooove Halloween! It's probably our favorite cardmaking holiday. 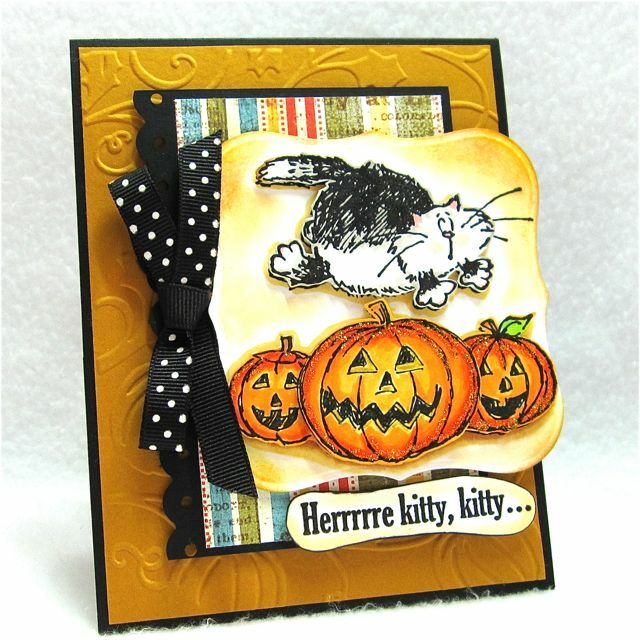 When I receive Halloween cards from Mom in the mail, it's not just one that arrives, but a whole package of 4 or 5! She is a crafty lady and I am so lucky to receive this little parcels of her creativeness on a regular basis. 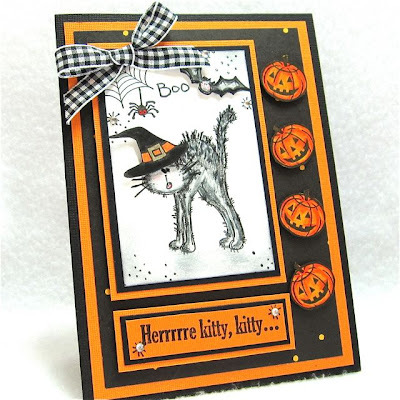 I've pulled 4 Halloween themed cards for you today. The first has a vintage feel. I love the lace that borders the left-hand edge of the card. Mom and I get a real kick out this one, because it looks like Mr. Pumpkin is looking down the young damsels dress and really enjoying himself! Look at that grin...lol!! 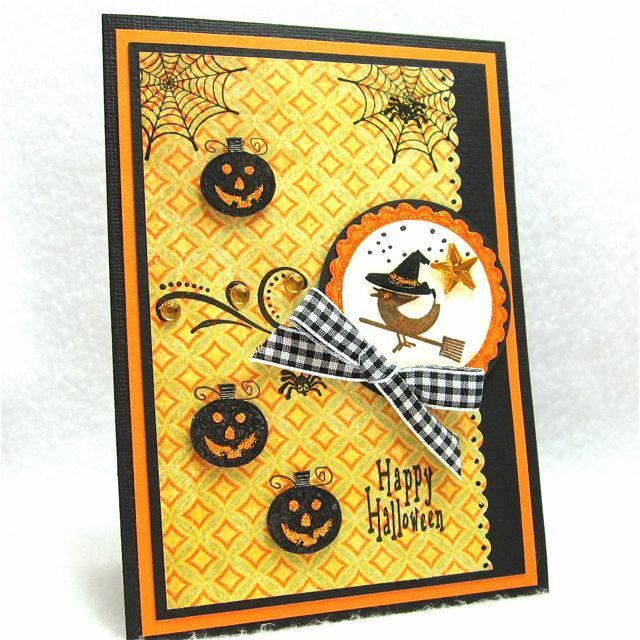 The second card features an adorable stamp by Hero Arts called Witch Bird. I love the background paper on this and all of the fab elements Mom has added to give Witch Bird some added pizazz. I'm not sure if I'll have anything for you tomorrow or Saturday, but rest assured I will have 3 cards (yep, three!) featuring brand new images from the Rock Squad by Kenny K on Sunday, so be sure to come back!!! Until then, have a fantabulous weekend! Love it when your mum takes a walk on the dark side! 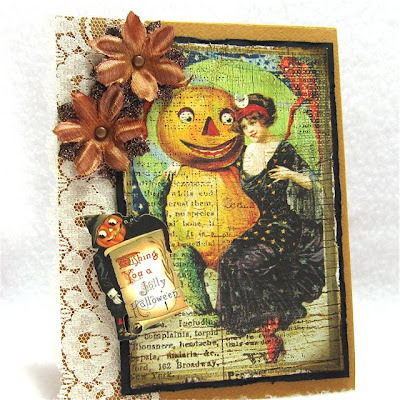 Thanks for sharing her beautiful halloween cards. oh I Love these not dark at all! gorgeous work AS ALWAYS Cheryl!! I love your Mum's cards and especially the last one with the PB kitty, so cute. 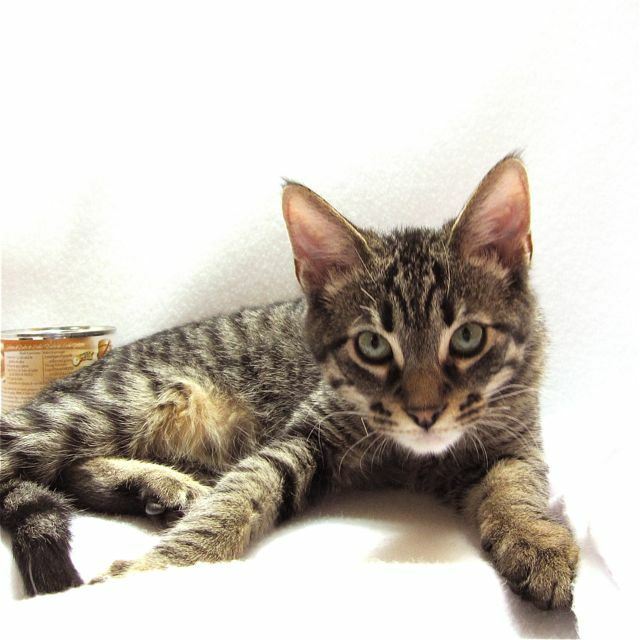 Titus is adorable, he is sooo handsome! I remember so well what it's like to have a kitten when you're trying to craft, it's impossible as everything seems to get 'stolen' or knocked off the table. One time Miaowski ran like a maniac thru the house and ended up hiding behind the cooker. She was terrified and I wonder what had happened ... a post-it note had got stuck to her behind!! fun halloween cards! Cute photo too! Ohhhhh WOWZERS! Mom's cards are just fabulous, Cheryl! I got a good chuckle from your comment about Mr. Pumpkin, so I had to go back and have a second and third look...too funny! The card is gorgeous and I love the lace too! All the cards are fab...it's so nice that you have a crafty mom...my mom doesn't quite understand my obsession with pretty paper, stamps and markers but she does appreciate the cards I make for her! Titus is sooooo handsome and he is getting soooo big! My cat, Liam, likes to chew plastic so if he gets in my room he chews the corners of my stuff and I ain't so happy either....totally understand where you are coming from with the paper concerns,smile. Can't wait to see your Kenny K previews with new images....Yay! I am totally hooked now! Thanks for you sweet comment on my card, hun...still no where near your breathtaking colouring, though! Oh this is fabulous....love it!! Waouw ! Fabulous cards ! The first one is gorgeous, I love the vintage style ! COngrats to your MOM ! Always a treat to see Marilyn's work! I really love the first card--scary cute! And Titus is growing so fast! Such a handsome guy! Hi, Marilyn, Halloween must be your favorite time. I can see the love you have pout in them.